Description: Listen closely. You can almost hear the soft whisper of the Pine branches as they dance in the wind. 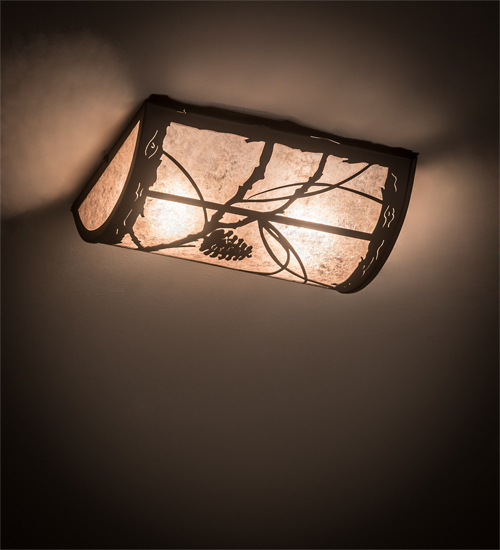 Enjoy the warm ambiance of soft beautiful light projected through the curvaceous Silver Mica diffuser featuring stunning Pinecone and Pine branch designs in a unique oblong shape. Hand finished in a handsome Oil Rubbed Bronze. The ceiling fixture is handcrafted by highly skilled artisans in Yorkville, New York at the foothills of the Adirondack Mountains. Select the finish and size of your choice. Energy efficient lamping options available. Pricing may vary with custom options. UL and cUL listed for dry and damp locations.